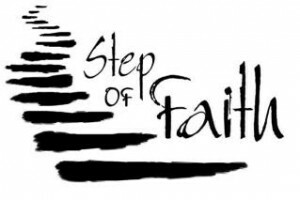 Pertaining to the use of the phrase, Step of Faith, I’m referring to situations whereas members of the Body are addressed with a decision and they are not sure what to do. I’m not referring to Faith in God as a believer. Many times I have heard advice given that says something like: “Sometimes, ya just gotta take a step of faith.” Also, I have witnessed this encouragement given when someone has a desire, but they do not know if it is God’s will. It is my understanding that this is a blind step of faith, and dangerous. For me, if I have not heard from the Lord and do not know His will, it is a good time to be still and wait on the Lord. The way I see it, taking a blind step of faith is a game of chance and it opens us up to fulfilling selfish desires. When I say “blind step of faith”, I’m referring to having no direction or knowledge of God’s will on the topic. Within my member, I see a the possibility of selfish desires that can take the lead in such a step of faith. When I look through scripture, I do not find brethren in the bible who took blind steps of faith. On the contrary, I see in each situation that they were either walking with the Lord already (knew His will), or they heard from the Lord, saw a burning bush that was not consumed, etc (again, direction received). Genesis 6:13-14 And God said unto Noah, The end of all flesh is come before me; for the earth is filled with violence through them; and, behold, I will destroy them with the earth. Make thee an ark of gopher wood; rooms shalt thou make in the ark, and shalt pitch it within and without with pitch. Genesis 22:1-2 And it came to pass after these things, that God did tempt Abraham, and said unto him, Abraham: and he said, Behold, here I am. And he said, Take now thy son, thine only son Isaac, whom thou lovest, and get thee into the land of Moriah; and offer him there for a burnt offering upon one of the mountains which I will tell thee of. I can go on and on.. Guidance from the Angel of the Lord, spoken words through prophets, guidance from the Word, Jesus Christ, etc. Praise God, we have the Word of God to know His will so that we may step in faith with guidance. We also have the Holy Spirit as our Guide to assist us. I have found that discernment must be obtained in order to decipher between our will and His will. Also, if we are abiding in Him, and He in us, we know His will because we have let this mind be in us that is also in Christ Jesus. For me, the flesh can be very deceiving in situations where we feel rushed to make a decision. I have had many of these in the past few years of my life, and I have remained faithful by not taking a blind step of faith. During such situations, I felt very pressured, anxious, worried, etc. I felt that I must make a choice and move forward. Praise God I did not move. Now I can see His will unfolding before my eyes, in His perfect timing. Blessed be the Lord. I pray this blesses someone, in Jesus name, amen.